A reminder of the joy of life, this stunning arrangement of orange and red floral favorites in a stylish bamboo cube is a gift that will be loved - and remembered. 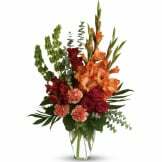 • This opulent bouquet includes orange roses, orange asiatic lilies, green anthuriams, red gerberas, red gladioli, green carnations, and accented with assorted greenery. • Delivered directly to the funeral home, church, or family residence. 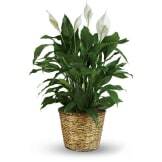 • Measures approximately 21" W X 39" H.
Flowers will be received by a Sharp Funeral Home's staff. 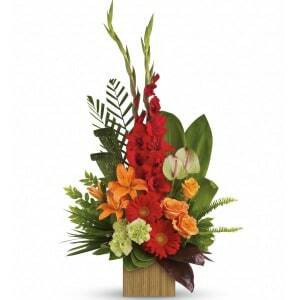 This was the first time that I had ordered from The Sympathy Store and I was VERY pleased. The arrangement looked exactly like the picture and was just beautiful. They give you the size of the arrangement on the site where you look, so I got my tape measure just to check it out and it was just what I was looking for. It is also suitable for a man or a woman. This site was very easy to use and I was finished with my ordering in seconds. Everyone should give it a try. All of our flowers are designed and delivered by hand from a local florist in in Carroll.